Author’s note: In the first and second articles of this series, I discussed the rationale for why the reverse-band back squat might be safer and more effective for strength and power purposes than conventional back squats. I’ve included a brief summary of the two articles below before I delve into the new material, but you can read the articles in their entirety to get a more detailed understanding. I’m finally back. I didn’t expect there to be much clamoring about my absence in the blogosphere, but a little clamoring would’ve been nice for my self-esteem while my stressful schoolwork had me questioning my self-worth. Regardless, I’m back to discuss my recommendations for using the reverse-band back squat and similar exercises in training programs. 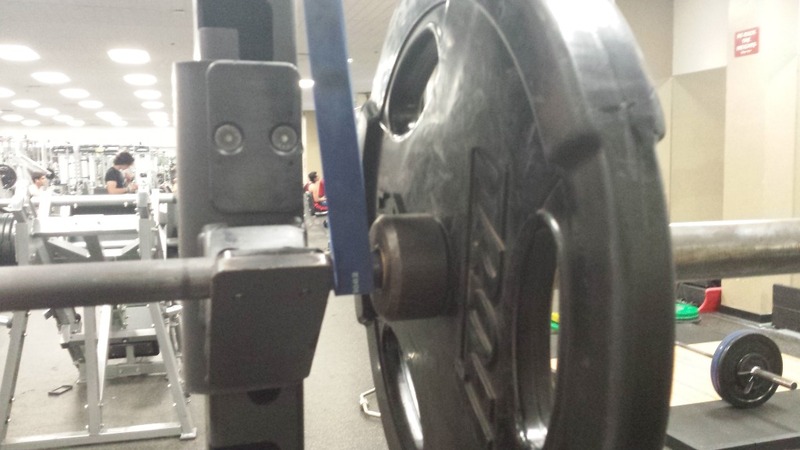 Behold, the reverse band back squat. To summarize my first two posts in this series, the reverse-band back squat allows a person to train at a high intensity without compromising their technique as much as they would while performing a conventional back squat at the same intensity. Why? Accommodating resistance creates a better match of the external load and the strength-curve for the exercise. Consequently, there’s less of a chance that the back extensors will fatigue prematurely and that the person will perform the infamous and deleterious “squat-morning.” If the spine and pelvis become mal-positioned–with the spinal erectors bearing the brunt of the load–muscles such as the gluteus maximus and hamstrings can’t fire optimally. This figure demonstrates the dreaded squat-morning, which is due to the inability of the back extensors to extend the torso as the person ascends from the bottom of the squat. Expressing this in a way that might be relevant to people familiar with the Postural Restoration Institute and its precepts, the reverse-band back squat reduces the likelihood that a trainee will adopt an extension-based posture to stabilize during the exercise. You can cue someone to “keep their ribs down” (i.e., maintain a zone of apposition) during an exercise, but if they’re doing an exercise that biomechanically encourages them to adopt an extension-based posture–such as the back squat or the good morning–then it’s likely that the person won’t be able to avoid reverting into an extension-based posture. It seems, at least in my experience, that few trainers and trainees appreciate this potential benefit. 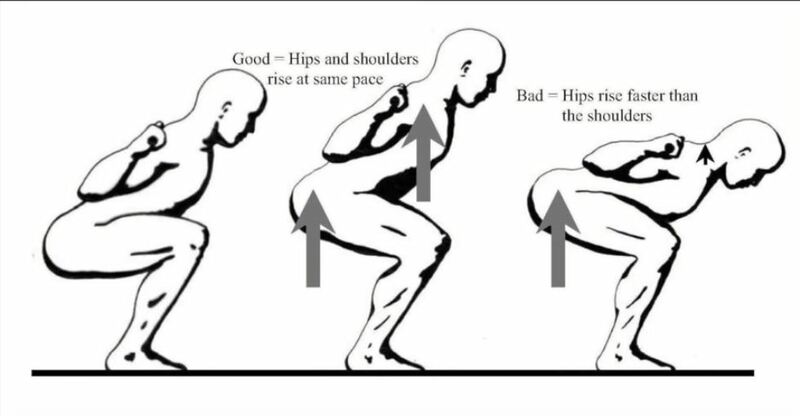 I’m not claiming that someone’s technique will always be perfect with a reverse-band back squat or that their technique will always be better than if they’d performed a conventional back squat, but there is a strong likelihood that those things will be true for the majority of people. An additional benefit of the reverse-band back squat that I briefly mentioned in the second post is something that is more known: accommodating resistance is better for improving power production. When using accommodating resistance, the external load increases as the person approaches lockout. Thus, there’s less of a need to decelerate your movement—the increasing external load will help you do that. This phenomenon is well-documented in research and many people, such as Louie Simmons, have promoted the use of accommodating resistance for this reason for decades. Based on the above rationale, my prescription might not be surprising: instead of doing a conventional back squat, do a reverse-band back squat to spare your back and improve your strength and power. If I’ve done a good job of writing this series, then you’re hopefully wondering how you can perform the reverse-band back squat. As the exercise’s name implies, you need bands. Specifically, you need a pair of identical thick bands. The bands I use, which have been excellent for myself and my training partners, are the #3 blue bands from Serious Steel Fitness. According to their web site, each band provides between 25-80 pounds of resistance. If you’re a seriously strong person, then you might need to get stronger bands, but I expect that these bands work well for beginner and intermediate lifters. You can go to the website to purchase the bands by clicking on the above image. The bands aren’t inexpensive, but the good news is that you can use them for more than just reverse-band back squats. They can be incorporated into pressing exercises like push-ups and bench pressing, deadlift variations, and various stretches, to list only a few potential uses. I consider them to be a worthwhile investment for anyone who resistance trains regularly. Once you have your bands, then what? There are conflicting opinions about how to set up bands for areverse-band setup. My recommendation is to attach the bands so that they have tension throughout the entire range of motion (i.e., the bands never slacken). Thus, there should be some, albeit perhaps slight, tension on the bands at lockout. In case you’re interested, the other approach, which I don’t recommend, is to attach the bands so that they are slack at the lockout position and the few inches preceding the lockout. While this other approach allows you to better determine the external load at lockout, I expect that it also decreases the power output and technique benefits of using accommodating resistance. 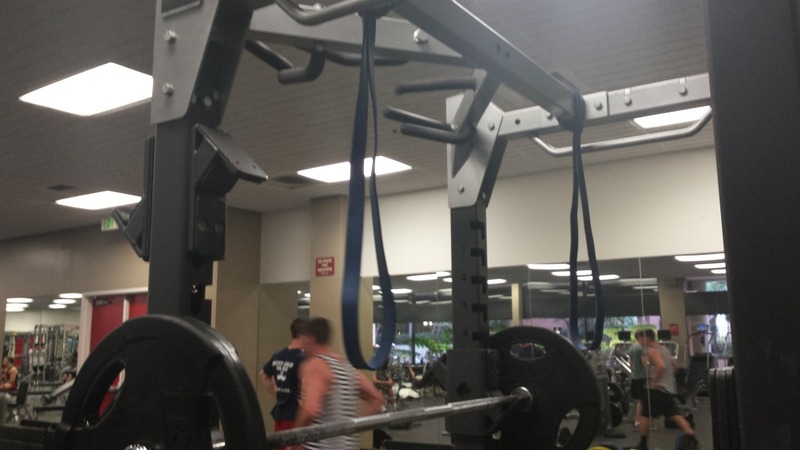 Here’s how the bands should be attached to the rack for a reverse-band back squat. Following the former approach, you may need to attach one end of the bands to the top of the squat rack and loop the other end of the bands around the barbell so that the band is stretched enough that it maintains some tension. When you attach the bands to the barbell, place them just inside the collar on each end of the barbell. Doing so makes sure that the bands are equidistant and that the loading is symmetrical (or very close to it). Determining how much tension the bands should provide at various points in the range of motion is an important issue. For example, should the bands provide an assistance that’s equal to 10% of the bar weight or 30% of the bar weight in the hole? Alas, I don’t have a conclusive answer to this question and I don’t know if anyone does (maybe that’s what I’ll research next semester for my biomechanics project). Based on what I’ve read from Louie Simmons, he recommends that the bands provide an assistance that is 15-20% of the bar weight. For example, someone who has 300 pounds on the bar would want to have between 45 and 60 pounds of assistance at the bottom of the squat. In my own experience and the experience of my training partners, this amount of band assistance seems to work well. Though I wish I could give you a firm answer, my advice is to experiment to find what works best for you. As a rule of thumb, though, using too little band tension seems like it’d be less effective and more dangerous than using too much band tension. To determine approximately how much band tension there is at the bottom of the squat, put a light weight on the barbell, unrack the barbell, and see at what height the bands can support the weight of the barbell—the barbell should be suspended from the bands. Thus, if the total weight of the barbell is 65 pounds and the bands suspend the bar at about the height that the bar would be at the bottom of your squat, then you know that the bands will provide about 65 pounds of assistance at the bottom of your squat. Attach the bands just inside the collar of the barbell (as shown in this picture) to ensure that the bands are the same distance from the middle of the barbell. Once you’ve finished attaching the bands to the barbell, you’re done setting up and you can proceed with your squats as you normally would. Because of the assistance that the band tension provides, you should be able to put more weight on the bar than you would with a conventional back squat. Otherwise, your sets and reps should remain the same as they would be for a conventional back squat. That being said, each particular rep and set will likely feel much different. 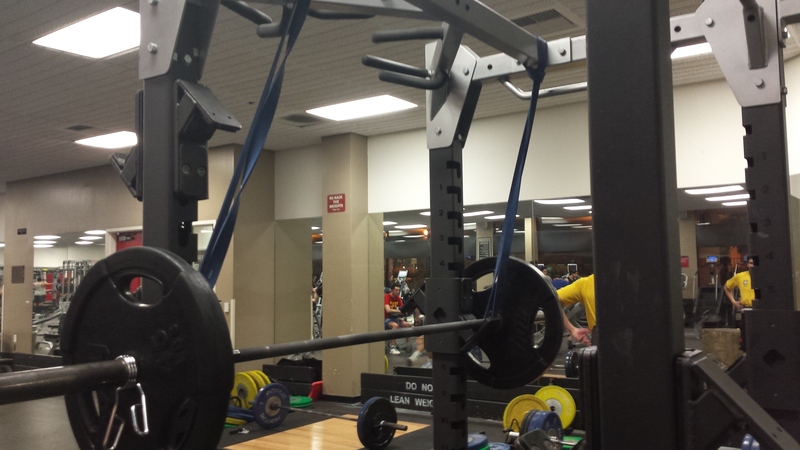 This picture shows the final setup for a reverse-band back squat. With the reverse-band back squat, I’ve performed everything from heavy singles (okay, heavy for me—“heavy” can be a relative term) to 20-rep sets to dynamic effort sets. Though these can be intense and grueling, the reverse-band setup makes it much, much easier for me to maintain a better form and perform the exercise with better biomechanics. Because the external load matches the exercise’s strength curve, each rep feels much “smoother”, as there’s less of a sticking point—in fact, it often feels as if there isn’t a sticking point at all. “Keeping the ribs down” (i.e. keeping a neutral spinal alignment and zone of apposition) becomes much easier as well, even while squatting at a high intensity. The result is that you probably won’t feel your back extensors working as hard, and you should be feeling your legs working a lot more. After reading this article, you should know everything you’ll need to try reverse band back squats. I expect that the use of this exercise will have significant benefits for people of many different training backgrounds, from athletes to powerlifters to those who lift weights recreationally; the benefits in improved technique and power production are simply a boon to anyone who lifts. In the next installment of this series, I plan to discuss other forms of accommodating resistance—the reverse band setup isn’t the only method—and how and why I incorporate each of them within a training program. Thanks Rob, informative and definitely going to replace back squats for me. Question: do you think that the benefits are similar for overhead squats? It seems like there’d be the same benefits for overhead squats, too, since the overhead squat has the same strength curve (i.e., it’s more difficult at the bottom of the squat than it is near the lockout). The benefit might be even more noticeable for the overhead squat, too, since, at least from my experience of doing and watching other people do overhead squats, there’s a strong tendency to have an extreme arch in the back. Using the reverse band setup might mitigate some of this gross spinal extension. I imagine there are two slight differences between the reverse band versions of the overhead squat and the back squat: 1) you might want less band tension in the overhead squat because you’re using less weight, so you might want to use a weaker band or use the same band but set up such a way that there’s less tension. 2) It might require a little more ingenuity to set up the bands for the overhead squat, but it doesn’t seem impossible and I expect you’ll be able to figure it out.